Krystal Dorris carries her 4-year-old daughter Tuesday after she was bused to a local Walmart after a shooting incident at Robert McNair Discovery Learning Academy near Decatur, Ga.
A man walked into an Atlanta-area elementary school, ordered a school employee to call a local TV station and fired multiple shots at police Tuesday. No one was injured in the shooting at Ronald E. McNair Discovery Learning Academy in unincorporated DeKalb County outside Atlanta, county Police Chief Cedric Alexander said Tuesday afternoon. 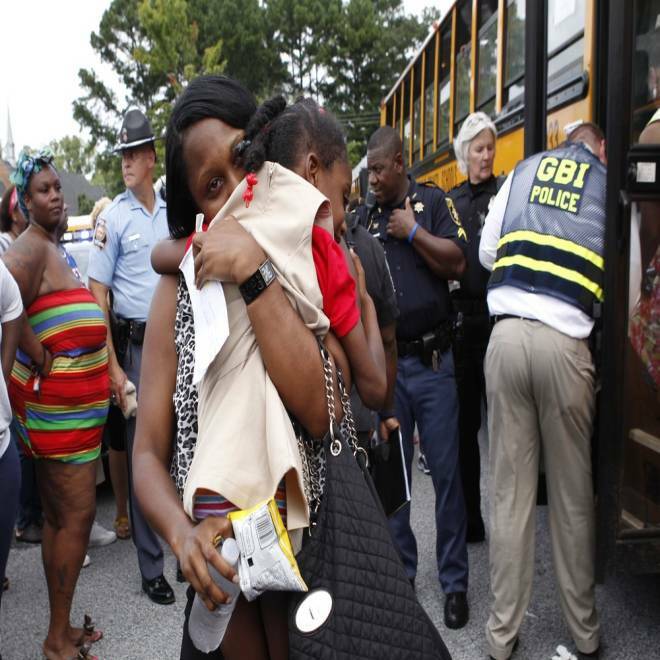 A county schools spokesman told NBC station WXIA of Atlanta that all pupils had been accounted for. 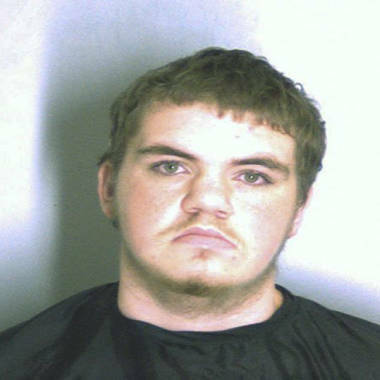 A jail booking photo of school shooting suspect Michael Brandon Hill, 20, seen in Decatur, Georgia, on Tuesday, Aug. 20. The suspect, identified as Michael Brandon Hill, 20, was wearing black and was armed with an AK-47 assault-style rifle when he fired about six shots at police before surrendering peacefully when they returned fire, officials said. "We were ... lucky we didn't have anyone killed in the school," Vernon Keenan, director of the Georgia Bureau of Investigation, told the Atlanta Journal-Constitution. Investigators examined what they believed to be the man's car after police dogs indicated the presence of explosives, Alexander said. Police later said no explosives were found. Hill, who had other weapons, was in custody charged with aggravated assault on a police officer, terroristic threats and possession of a firearm by a convicted felon, police said Tuesday night. There was no immediate word on when he would appear in court. A sheriff's official in Henry County, Ga., south of Atlanta, said Hill was charged there in March with making terroristic threats — a felony in Georgia. The details of that case couldn't immediately be determined, but court records show that he was sentenced to three years' probation and anger counseling. Alexander wouldn't speculate when reporters pressed him for an explanation of why the man went to the school. In announcing the charges Tuesday night, police made no reference to a possible motive. Visitors are supposed to be buzzed into Ronald E. McNair Discovery Learning Academy, leaving many asking how the shooter managed to get into the building. NBC's Gabe Gutierrez reports from Decatur, Ga. The drama began about 1 p.m. ET when the gunman simply walked in behind someone else, Alexander said. Once inside, the gunman told a clerk to call Atlanta TV station WSB. The clerk told a WSB assignment editor, Lacey LeCroy, that the gunman wanted the station to "start filming as police die." "All the time of doing this, I never experienced anything like this," LeCroy said. "It didn't take long to know that this was serious." LeCroy said she heard gunshots but didn't know whether anyone had been shot. She said she stayed on the line in silence with the clerk for about five minutes before the woman told her: "They got him. They got him." Alexander said the man had barricaded himself in the school office. He opened fire on officers from at least a half-dozen law enforcement agencies that raced to the school, getting off about six rounds before officers returned fire, Alexander said. The man surrendered, and explosives dogs "hit" on his vehicle a short time later, Alexander said. A fourth-grade student details the rescue effort after a gunman opened fire at Ronald E. McNair Discovery Learning Academy near Atlanta. The school was evacuated, with officers leading pupils out a back entrance. Authorities cut a hole in the perimeter fence behind the school and shepherded the pupils into a field, where they were picked up by buses and taken to a nearby Walmart store. Hundreds of frantic parents dashed to the store to make sure their chldren were all right. "My husband called and said there's a gunman at the school," said Linda Bell, the mother of a McNair School pupil. "I'm like, what?!" School volunteer Debra Hayes told The Associated Press that she encountered the suspect without realizing it. Hayes saw a man talking to a secretary when she stopped by the office at the end of her shift but she did not see a gun. "I heard him say, 'I'm not here to harm any staff or any parents or students. He said he wanted to speak to a police officer," she recalled. "By the time I got to 2nd Avenue, I heard gunshots." The father of another pupil told WXIA that school officials "definitely need to upgrade" security. "Anybody can walk into the school," said the parent, whose name wasn't reported. Neighbors told WXIA that Hill moved into a house in Decatur that he shared with several roommates about a year ago. Late Tuesday, police were still searching the house, which is just a short distance from the school. NBC News' Elisha Fieldstadt, Kurt Gregory and Matthew DeLuca and The Associated Press contributed to this report.